The Los Angeles Dodgers today selected the contract of right-handed reliever Peter Moylan (#41) from Triple-A Albuquerque after optioning right-hander Javy Guerra to Albuquerque following last night's game. To make room on the 40-man roster, the club transferred left-hander Scott Elbert to the 60-day disabled list. Moylan last pitched on Tuesday at Memphis, striking out one in a scoreless inning, and is 2-1 with two saves and a 3.52 ERA in 17 appearances with the Isotopes this season. 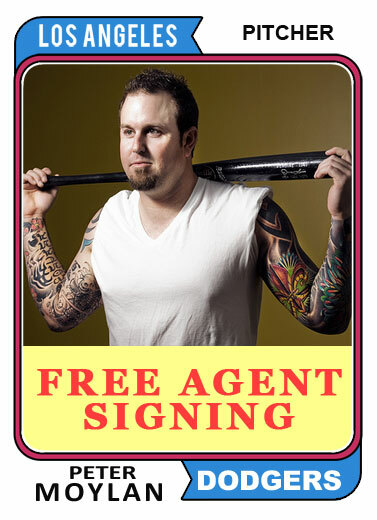 Moylan, 34, posted a 1.80 ERA in eight games with the Braves last year and is 20-9 with four saves and a 2.59 ERA in 295 career relief appearances all with Atlanta from 2006-2012. Guerra made nine relief appearances with the Dodgers after his recall on April 30, posting a 6.75 ERA (8 ER/10.2 IP). Check out my previous post from February that focused on the incredible tattoo artwork that he has, here. BTW, the pic above is a fantasy card I made of Moylan back in February. Manny Mota Says "Get a Grip"
OK... I admit it. The title to this post is entirely misleading. But, what the heck, eh? If I want to make the big bucks from this blog I gotta find some way to make you click. After all, I could really used that 1/100 of 1 cent I theoretically make from Google Ads. Featured in this post is something I've never seen before. It is a vintage tube of Manny Mota Grip Aid that comes in a cylindrical tube and is emblazoned with the smiling mug of our favorite pinch hitter. This stuff is very similar to pine tar. In fact, it's a great alternative to that messy stuff. It is reusable, won't stain your uniform, and will allow you to get a stronger and firmer grip on the bat. As I'm sure you know, this product still exist on store shelves today. In fact, numerous companies sell what looks like a re-branded version of this product called "Manny Mota Grip Tape". BTW, the grip tape featured in this post was produced by Manny Mota Enterprises. Unfortunately, I do not know the date when this particular item was manufactured. The above 1958 Topps Gino Cimoli card is one of the all-time great cardboard blunders. As you can see, Topps colored out the background to a bright yellow, but at the same time removed the bat that he was no doubt swinging. So, as a consequence he looks mighty weird in that pose. Gino Cimoli was a Bay Area born outfielder who signed with the Brooklyn Dodgers in 1949. He slowly moved up the ranks and impressed in AAA, but stalled as more seasoned pro's filled out the roster in Brooklyn. Names like Snider, Amoros, Furillo, Shuba and Gilliam blocked his progress. Soon, though he could not be stopped. He finally made his first Major League appearance in 1956, and although his numbers were not great he was undaunted. He wanted to play, and didn't care where. 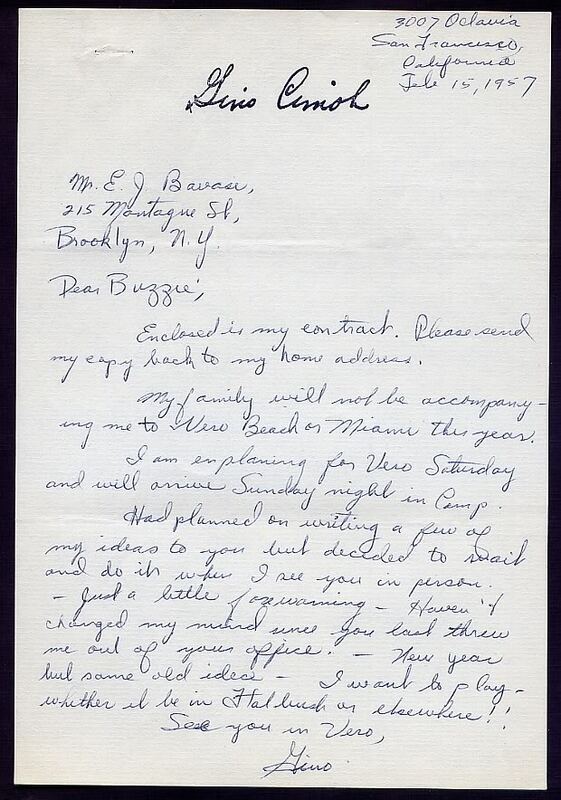 Per a letter I ran into on eBay, check out what Gino wrote to Dodgers GM Buzzie Bavasi in February of 1957. Dear Buzzie, Enclosed is my contact. Please send my copy back to my home address. My family will not be accompany-ing me to Vero Beach or Miami this year. I am enplaning for Vero Saturday and will arrive Sunday night in Camp. Had planned on writing a few of my ideas to you but decided to wait and do it when I see you in person. - Just a little forewarning - Haven't changed my mind since you last threw me out of your office. - New year but same old idea - I want to play - whether it be in Flatbush or elsewhere!! See you in Vero, Gino." Play me or trade me is what he said. As history tells us, Cimoli did stay on with the Dodgers and got regular playing time in the outfield during the 1957 season. In fact, he had a career year. Gino batted .293 and slugged 10 home runs. He also made his only appearance in the All-Star Game that season. Unfortunately, his star would soon fade for the Dodgers. Cimoli was traded to St. Louis in 1958 for Wally Moon. And as they say, the rest is history. BTW, Gino Cimoli is the answer to a great trivia question. He was the very first player to go to bat in a West Coast Major League game. 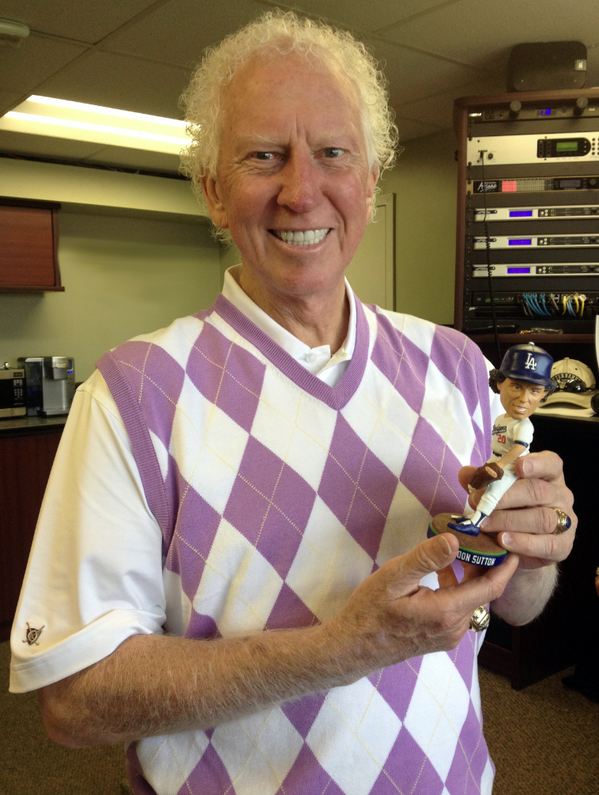 Here is Don Sutton with his Dodger bobblehead that will be given out this coming Thursday, June 6th at Dodger Stadium, pic via @Dodgers on twitter. "Does It Make Sense to Replace a Manager During the Season?" By Jonah Keri at Grantland. It becomes more clear why Federowicz was called up. Via Austin Laymance at ESPN, AJ Ellis has an issue with his left oblique. 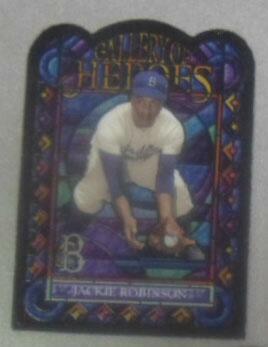 Topps shares a preview pic of a Jackie Robinson 2013 Archives Gallery of Heroes insert card on twitter. See it on the right. Via Tom Hoffarth at Farther Off the Wall, we find out that Ross Porter will be back in the broadcast booth at Dodger Stadium tonight as a part of the Fox Sports West crew covering the CIF Southern Section Division III title game. Dylan Hernandez at the LA Times tells us that Josh Beckett will be seeing a nerve specialist on Monday. The Sons of Steve Garvey puts together a nice article for Big League Stew. It's a local's guide to enjoying Dodger Stadium. I missed this last week. 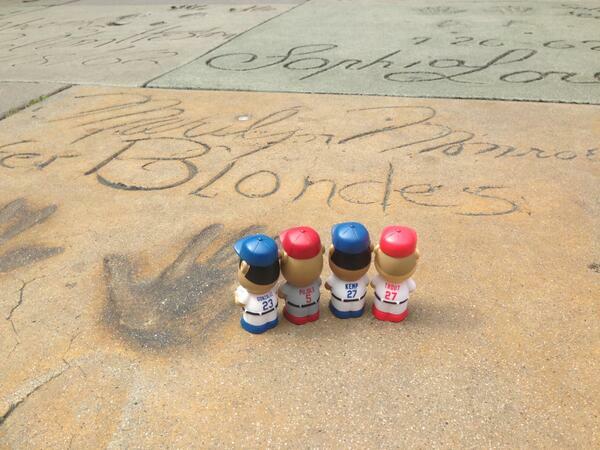 Topps was in Hollywood and shared a pic on twitter to prove it. Check it out below. They brought along some 2013 Big League Mini figurines. This is the craziest trade proposal I have ever read. Via Bob Verdi at the Daily Herald, we find out that former Kings and Lakers owner Jack Kent Cooke once proposed trading Wilt Chamberlain to the Bulls in exchange for Bobby Hull of the Blackhawks. Sometimes I miss the infectious smile of Manny Ramirez. Check out what his teammates in Taiwan did to celebrate his 41st birthday yesterday in the video below.